This weeks featured thread takes a look at the potential for the bosses in the upcoming Legend of Zelda title for the Nintendo Wii. The thread discusses a few different topics, but listed below are two posts with some interesting ideas. One of the many complaints about more recent Zelda games is that the bosses have gotten incredibly predictable and in many cases very easy. In Spirit Tracks, each of the dungeon bosses required use of the same item that you got within the dungeon. This right away takes any sort of item strategy away as in each of the boss battles there was only one item that actually worked. I personally would love to see bosses that can be defeated in multiple ways, each of which have their advantages and disadvantages. Take a game like the classic Mega Man titles for example. For each of the robots you fought, there was always one item that worked extremely well against them, while in many cases there were some items that worked decently, and others that didn’t work at all. Perhaps the item that worked best was dangerous as it required you to get up close with the boss. Alternatively there was very safe item that you can use, but it didn’t do nearly as much damage. This adds a lot of trial and error while also giving the gamer some options and allowing for different strategies. This is something that has been left out of Zelda for quite some time and I’d love to see a return to this in the future. Another option for when you fight bosses is to require more than one weapon. Let’s think all the way back to Trinexx from A Link to the Past. He was the boss in Turtle Rock and in the first phase of the battle there was a fire head that shot fire out of its mouth and an ice head that shot ice out of its mouth. In order to get past this first phase, you had to use both the Fire Rod and the Ice Rod, by attacking the head of the opposite element. This was brilliant on multiple levels! First off the items used were the Fire Rod, which was an item that you got four dungeons earlier, and the Ice Rod, which was an overworld item that you might have not even gotten up until this point. Neither of which were found in the dungeon where you actually fought the boss! Yet this was just the first phase of the boss battle! This is how boss battles can be and I sure hope to see more unique battles like this in the future. One of the other points brought up in the topic is that of optional boss battles. I think this is nice and it has been done multiple times in Zelda in the past and there seems to be little reason for this not to continue. The obvious one that comes to mind is that of Link’s Awakening DX and the Color Dungeon. There were two mini-bosses and a dungeon boss all within an optional dungeon that you never even needed to step foot into. Better yet, the reward that you got wasn’t just some piece of heart or a useless item that you’d never use. Rather, it was a very useful tunic upgrade to either your power or defense. Even in Link’s latest adventure in Spirit Tracks on the Nintendo DS there was an optional boss in the Take Em All On mini-game. During the third phase of the Take Em All On game, not only do you get to fight all five of the dungeon bosses for a second time, but after they have all been defeated, a new completely optional boss awaits in the form of Dark Link! Not only was it sweet to fight another boss, but it was also nostalgic considering Dark Link has made several appearances in previous Zelda titles. These few points only touch the surface of what boss battles should and should not be in future Zelda titles. So you’ve heard from the members in the forum topic and you have heard from me, but what about you? Do you like what they have done with boss battles in recent times? Did you enjoy the more unique ways of battling bosses in Phantom Hourglass and Spirit Tracks? Have they been getting too easy? Too predictable? Too boring? Let us know by posting in the comments below. 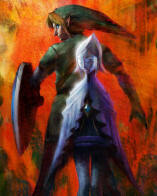 Check out more Zelda Wii topics and discussion over at our Zelda Wii Forum.